The view inside the bridge. Looking up from the second-floor performance hall. The centre’s western wall morphs into the bridge that rises 20 metres above street level. 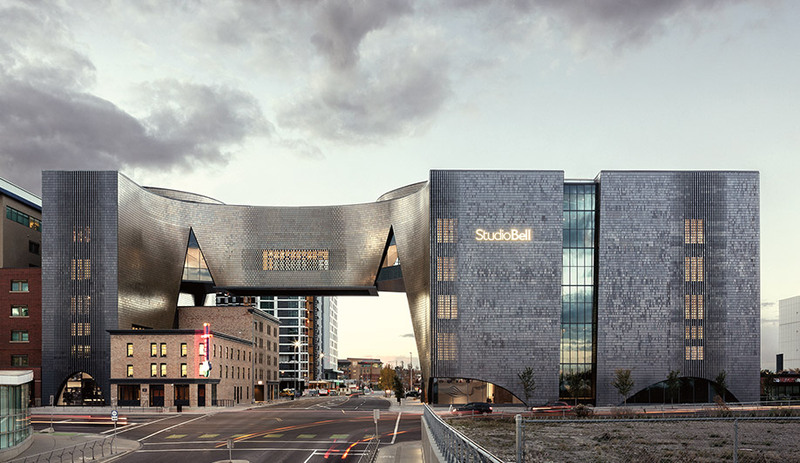 Between Calgary’s skyscrapers and the confluence of the city’s two rivers stands Studio Bell, the dramatic new home of the first centre celebrating Canadian music history. With a curved western wall that morphs into a double-height bridge spanning Fourth Street SE, it’s not a building that will go unnoticed. It looms over and incorporates the King Edward Hotel, a beloved relic of the East Village. Originally built in 1905, the hotel served as a music-scene fixture through the 20th century, hosting such blues legends as Buddy Guy, B.B. King, and Pinetop Perkins. 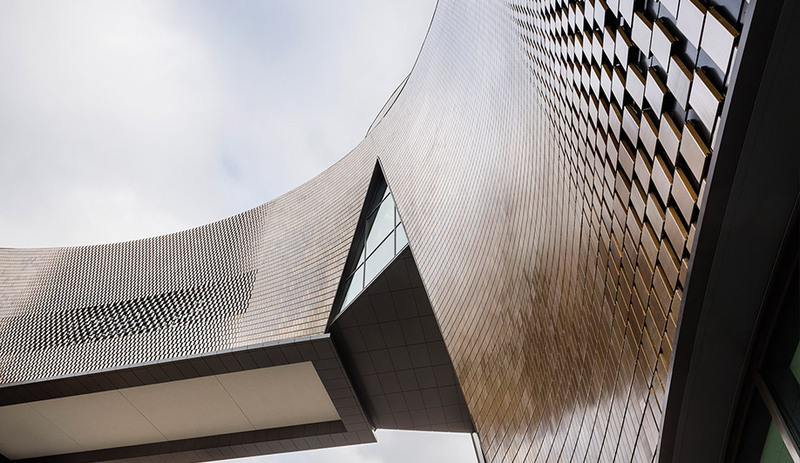 The two buildings now house the National Music Centre, with Studio Bell a statement-making piece of architecture, especially in a city that has only recently begun a love affair with design. With a core full of bland office towers and surrounded by sprawling suburbs, Calgary has started to make way for signature projects, most notably a pedestrian bridge by Santiago Calatrava that crosses the Bow River. Snøhetta and Dialog have also broken ground on a public library that will straddle an LRT line, and Bjarke Ingels Group is inserting Telus Sky, a mixed-use tower slated to open this year. It sits next to The Bow, by Foster + Partners. 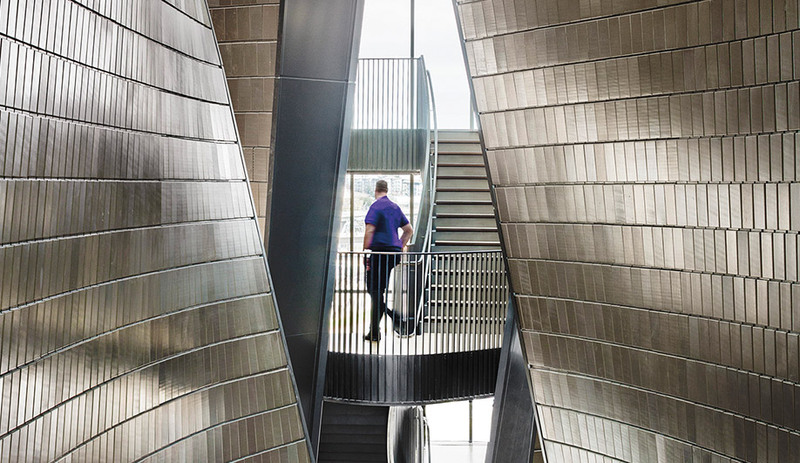 Calgary is not yet an archi-tourism hot spot, but the ambition is there. Angular openings between floors are reminiscent of natural rock formations. 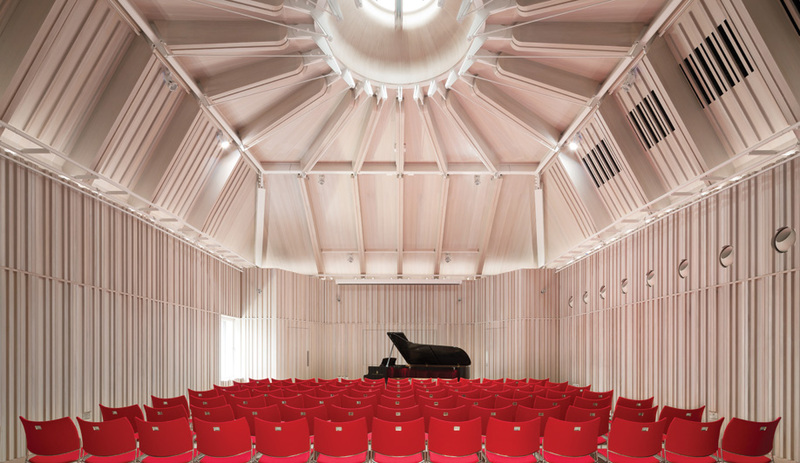 The openings, along with sound absorbing terracotta tile walls, help turn the centre into one massive concert hall. There is no denying the centre’s complexity. 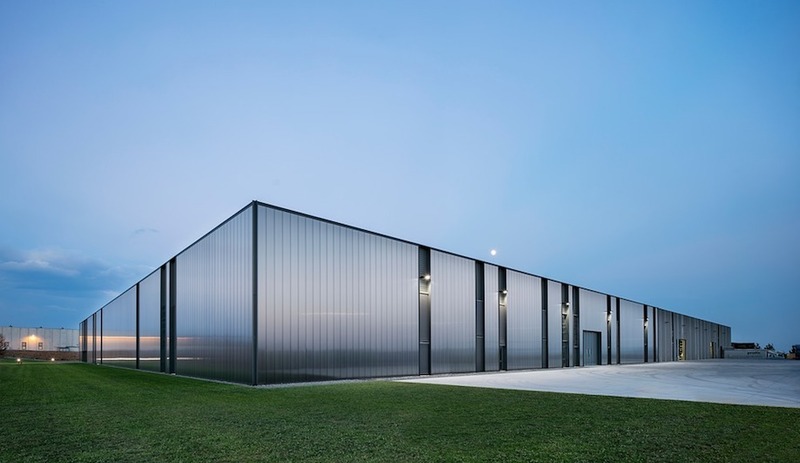 Its five floors house galleries for a collection of musical-instrument-related artifacts numbering in the thousands, as well as space for recording facilities, workshops and a 300-seat performance hall. Cloepfil prefers to explain the navigation using a printout of computer-modelled shapes. Though it presents a unified front, the main building is composed of nine curved “vessels” linked by bridges on each floor. 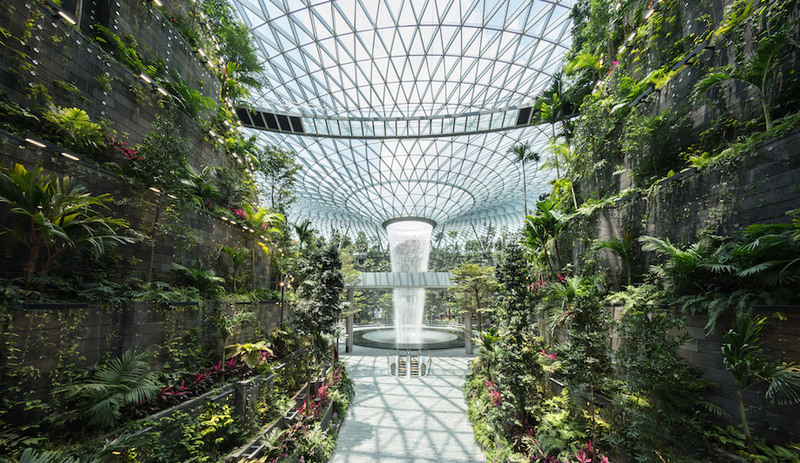 Each vessel plays host to a different musical exhibit, or “stage.” The walkways connecting them offer moments of relative silence. 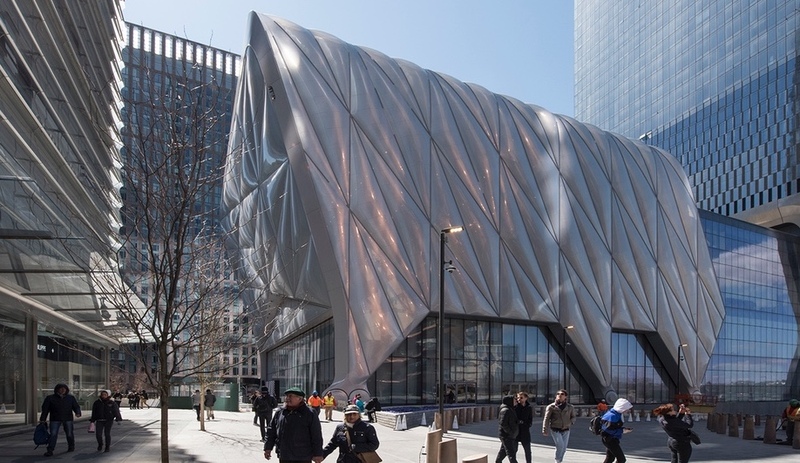 From the lobby, the first eye-catching view is of the second-floor performance hall and its dazzling ceiling – row upon row of thin, luminous aluminum tubes. The atrium rises five stories, providing a variety of perspectives framed by swoops and angles. Guiding the first group of journalists through the space before the opening last October, Cloepfil himself would occasionally pause to admire a sightline he hadn’t previously noticed. 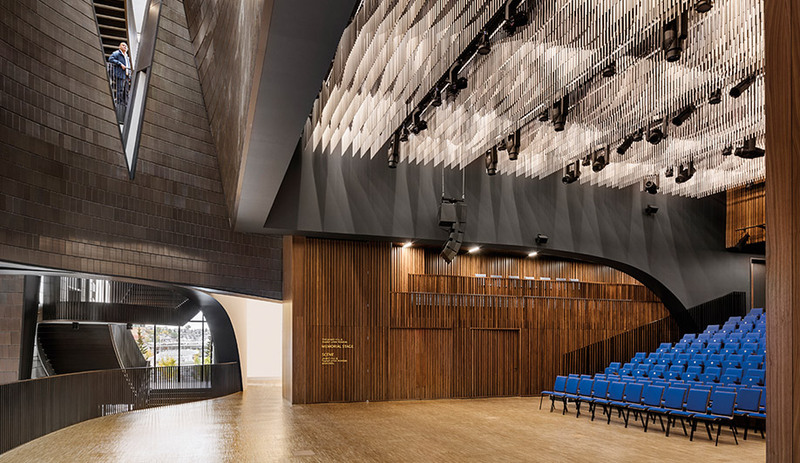 Sound quality was integral, so AWA turned to Jaffe Holden, the Connecticut acoustic consulting firm that has worked on some of the largest performance centres in North America, including the Lincoln Centre in New York. 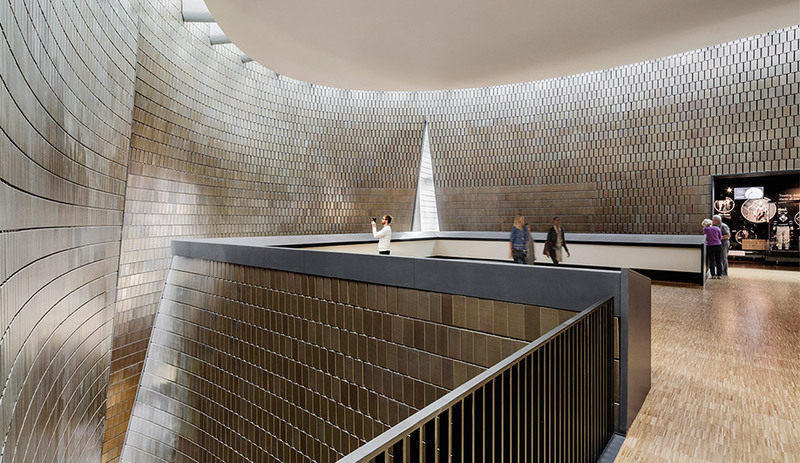 For Studio Bell, the interior walls are lined in the same iridescent tesserae used on the exterior; in total, the centre boasts over 200,000 glazed terracotta tiles developed by Royal Tichelaar Makkum in the Netherlands. When the acoustic wall of the performance hall retracts, most of the building fills with music. 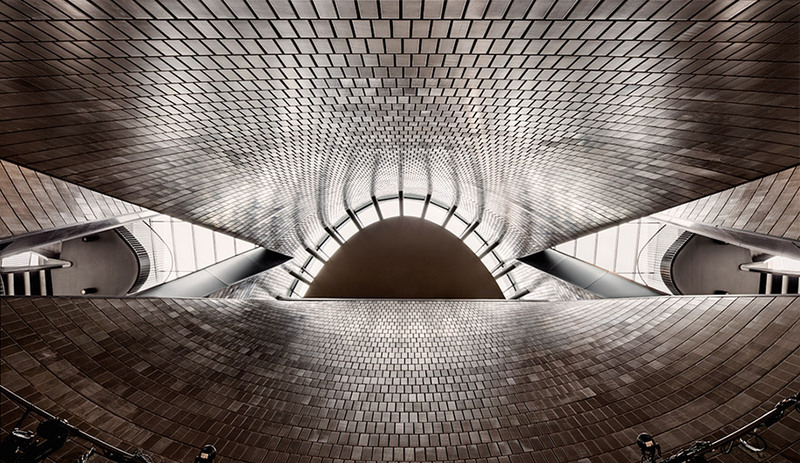 The tiled walls, backed with absorptive material, help soak up sound, while the building’s multiple openings reflect it upward. This is what gives the centre its music festival feel. No matter where you are in Studio Bell, you are always an audience member, hearing the music as it filters through the building. The exhibit rooms, Mosker says, were designed with interactivity in mind: “NMC needs to be more than a stuffy museum.” For instance, in one room visitors listen to a selection of music through headphones, then write down what comes to them. Their thoughts are projected onto the walls. Elsewhere, a space full of synthesizers invites visitors to produce their own beats. The second floor charts the history of Canada’s music scene, from Joni Mitchell to Drake; and the fifth houses the Music Hall of Fame, where visitors can check out Stompin’ Tom Connors’ wooden stomping boards and Alanis Morissette’s harmonica, among other memorabilia. The NMC’s most hyped acquisition – the Rolling Stones’ Mobile Studio – resides in a room adjacent to the King Eddy, visible through huge street-facing windows. Two main volumes are connected by a bridge that spans 35 metres across 4th Street. The much beloved King Edward Hotel, a former blues bar, has been restored and now houses offices, recording studios and spaces for artists-in-residence. The incorporation of the King Edward was a requirement set out by the NMC from the beginning. When the landmark was condemned in 2004, there was public demand to save it; at the same time, Mosker was searching for a new home for the NMC. Before construction began on Studio Bell, the King Eddy was taken apart and put into storage. It was then reassembled, brick by brick, and integrated into the complex as a performance venue. Studio Bell’s mix of old and new is at the heart of the project; it signals the revitalization of the historic East Village while also making an empowering statement about the city’s future. Calgary once had multitudes of buildings just like the Eddy, but this heritage was sacrificed during the wild oil-boom periods. That the hotel has been spared the wrecking ball is a testament to a new way of thinking.